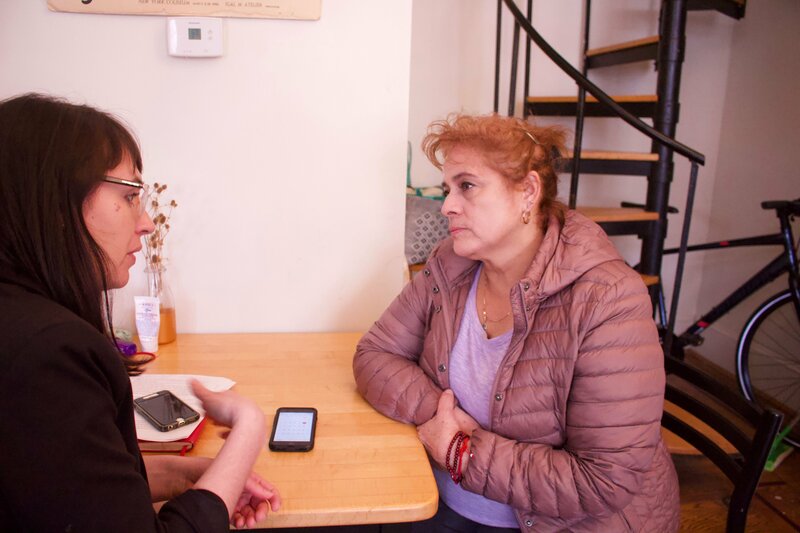 María del Carmen Díaz, 54, a domestic worker from Veracruz, Mexico, has seen a lot of what people do “in silence,” in their own homes, in her 24 years of experience working as a nanny, caretaker, and house cleaner in Philadelphia. She has been told she was hired simply because her skin was lighter than others who work in the profession; she has suffered last-minute cancellations and delays in payment; she has been questioned by employers about how it was possible that their children attended the same school. “We don’t exist. Although we’re there in all of the homes, we don’t exist,” she said. Del Carmen Díaz had no recourse to denounce workplace malpractice and discrimination. But now, she’s raising her voice and condemning those abuses as part of her commitment to the fight she has helped build within the Pennsylvania Domestic Workers Alliance (PDWA) to demand rights and legal protection for herself and other domestic workers whose labor conditions remain in the shadows, outside the reach of the law. PDWA plans to introduce the Philadelphia Domestic Worker Bill of Rights to City Council in the coming weeks, with the support of a principal sponsor of the bill, Councilwoman Maria Quiñones-Sánchez, as well as all of the women members of City Council. The legislation, supported by more than 30 unions and community organizations, would extend comprehensive protection to the estimated 16,000 domestic workers - many of them Black and immigrant women - who are nannies, caretakers, and house cleaners in homes across the city. PDWA’s legislative priorities include: mandates for written contracts; paid time off for vacation and sickness; advance scheduling notice; protection against retaliation from employers related to the workers’ immigration status or any other factor; creation of a board to oversee enforcement of the law; and more. If the legislation is passed, Philadelphia would become the largest U.S. city to sign into law a Domestic Worker Bill of Rights, following the examples of Seattle, which passed the Domestic Workers Ordinance in July 2018, as well as eight states across the country. The PDWA, a joint project of the National Domestic Workers Alliance (NDWA) and Philadelphia Jobs with Justice, is also led by Nicole Kligerman, a Philadelphian who has been working as an organizer for a decade. She said that the law stands to have a huge impact in Philadelphia, which, with nearly 26 percent of its population living in poverty, is the poorest large city in the nation. Kligerman noted that throughout most of the country, domestic workers are explicitly excluded from the most basic labor protections, including minimum wage, overtime, workplace safety, and freedom from sexual harassment and racial discrimination. In Philadelphia, even the Fair Practice Ordinance, which does extend some civil rights protections to domestic workers, still explicitly states that discrimination on the basis of race or any other factor for hiring and firing purposes is legal in the case of any domestic worker. “Part of our fight is that domestic workers are very invisible. They work behind closed doors. And what we are doing is also bringing to light the very important work that they do, and... the exclusions that they have in the law that come from slavery,” said Kligerman, who added that the labor groups often excluded from workers’ rights protective laws were domestic and agricultural workers, because those were the professions that many descendants of slaves worked in following abolition. For del Carmen Díaz, the legislation is part of putting into motion a foundational change not just in how the rights afforded to domestic workers are legislated, but also in how the work they do is viewed and valued in society. A change, she said, the seeds of which she has seen even in the worldwide reaction to the Academy Award-winning film “Roma,” Mexican director Alfonso Cuarón’s portrayal of the life of Cleo, a domestic worker in 1970s Mexico. “The first thing is respect. And from there everything else comes,” said del Carmen Díaz. Members of PDWA, along with Quiñones-Sánchez and other City Council representatives in support of the measure, will announce the pending legislation at a press conference this Thursday, March 14, at 9 a.m. on Floor 4 of City Hall.